The year is 1309, and the Knights Hospitaller have only recently finished their conquest of the island of Rhodes, although the city of Rhodes and its Byzantine garrison still holds out, and will do so for another year before it finally falls. In the Hospitaller headquarters, Grand Master Foulques de Villaret interrogates an elderly Greek Orthodox priest, who serves a small village on the outskirts of the island. Several of his men have gone missing in recent days, including three veteran Knights, and he demands that the Priest tells him what has happened to them. The priest denies knowing anything about their fate, and also claims not to know anything about reports of black-eyed strangers lurking in the forests around his village. Concerned about the fate of his men, the Grand Master instructs one of his best men, Sir Richard-at-Lee, and his sergeant-at-arms, to travel with the priest to the village and investigate the disappearances. Little does Sir Richard know that he will soon be colliding head-on with a mysterious cult and its blood-soaked plans for the island. 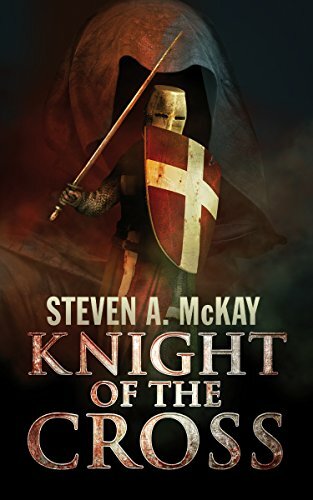 So starts Knight of the Cross: A Knights Hospitaller Novella by Steve A McKay, a novella that acts as a prequel to his popular Forest Lord series of novels; but while it is set in the same universe as the Forest Lord titles, has a distinctly darker tone and is actually a one-off adventure in the Cthulhu Mythos genre. Once again I was scrolling through the Kindle offerings under the Cthulhu and Lovecraft keywords, and once again a professional-looking cover stopped me for long enough to click on the title and take a look. I’m of the firm opinion that there are nowhere near enough Mythos stories that are set in periods prior to the 20th Century, and therefore the concept of the Knights Hospitaller fighting a band of Dagon-worshipping cultists immediately hooked me, as did the location of Crusade-era Rhodes, a location and period that I am only vaguely familiar with. I was immediately drawn to the characters of Sir Richard-at-Lee and his companion Jacob, as they travelled to the location of the mysterious disappearances, and I particularly enjoyed Sir Richard’s background of being a mercenary sufficiently skilled at fighting that he was invited to join the Knights. As they undertake their journey at the beginning of the story, the author deftly sets out their relationship, of two veteran soldiers used to each other’s company, and I was soon enjoying their characterisation. The other characters encountered during the tale are also similarly well written, and I rather liked the brief cameos by Grand Master de Villaret which bookended the story; the author’s note relates that de Villaret was both a historical character and renowned for his arrogance, and that certainly comes across in his appearances. The characters are well depicted and the writing is of a very high quality – as is the editing of the entire story – and the plot moves along swiftly, with some brilliant action scenes taking place, especially towards the end of the story as Sir Richard and his companions take the fight to the Dagon cult and try and disrupt their plans. It can be quite difficult to write a fight scene, especially one that involves swords and shields rather than firearms, but Mr McKay skilfully writes them, to the extent that it is all too easy to imagine every sword thrust and grunt of pain. Without wishing to spoil the entire story, I did enjoy the fact that there was a sting in the tail of the ending, and although Sir Richard would not be returning to Rhodes (apparently being a major character in the Forest Lord series) I would certainly like to see a sequel to Knight of the Cross that expanded on the influence of the Dagon cult and the response of both the Knights Hospitaller, and perhaps even the Byzantine garrison in the city of Rhodes itself. Knight of the Cross is a deeply enjoyable and self-assured piece of Mythos fiction, and is well worth a read! Wow! Thank you, it’s so nice to read a review by someone who actually knows about the Cthulhu Mythos! Most of my readers are straight-up historical fiction fans and I doubt many of them understood where I was getting some of the stuff in Knight of the Cross from.